Make sure the selenium supplement you take passed our quality review and is right for you! How do you choose the best selenium supplement? ConsumerLab.com tested and reviewed many popular brands of selenium containing forms of selenium such as selenium from yeast, selenium from kelp, selenomethionine, Se-methyl-L-selenocysteine, selenite and selenium picolinate. One product contained only 23.7% of its listed selenium. Another lacked necessary label information about one of its ingredients. 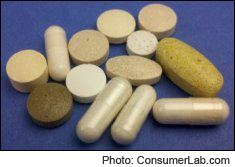 Fortunately, many other supplements were found to contain the selenium they claimed, were free of lead contamination (which can occur in mineral supplements), and, if tablets, were able to properly break apart. ConsumerLab.com also compared selenium supplements on cost, to help you find the best price and value. It found the cost of an equivalent amount of selenium ranged from just 4 cents to over $1.00! But cost didn't coincide with quality -- some high-quality selenium supplements cost only pennies a day, while the two most expensive products failed ConsumerLab.com's review.